Chocolate is all the rage. We are hearing all about the health benefits of dark chocolate and the new wave of craft chocolate makers. Chocolate is the new wine! But how can you tell that you’re eating the good stuff? What is real chocolate? And how is it different to a Mars Bar? But for Willie it doesn’t stop here, for him it is all about flavour. Not many people realise that just like coffee and wine, chocolates all taste different, depending on the origin and strain of the cacao they are made from. One may taste nutty, another of juicy summer fruits. 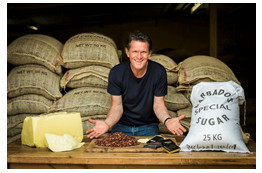 Willie started out buying a cacao farm in Venezuela 20 years ago, and set up the UK’s first artisan ‘bean to bar’ chocolate factory in 2008 with the dream of making the best chocolate in the world. 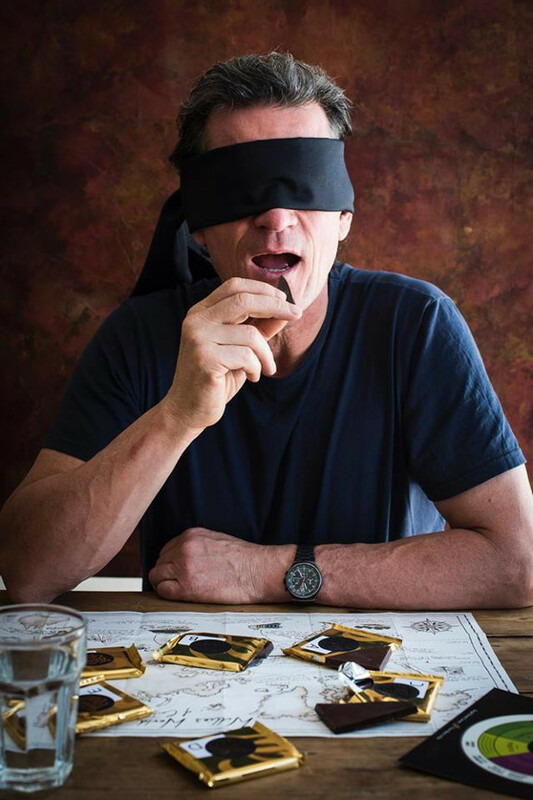 “When people eat our chocolate it’s like a light going on, as the chocolate melts and the realisation dawns that all this flavour comes simply from the cacao,” enthuses Willie. As a final hallmark of quality, it takes Willie up to 21 days to make his chocolate in small batches, which is more than 100 times longer than industrial chocolate. 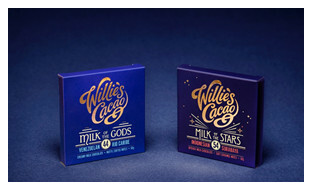 So how does Willie’s ‘real chocolate’ taste different to normal chocolate? If you have the self control, let a little melt slowly in the middle of your tongue. You’ll immediately taste more than just chocolate, you will get distinct notes of caramel or fruit or nuts. And these beautiful pure flavours will stay with you for 10-20 minutes after you have eaten the chocolate because there is so little fat to wash them away. What you won’t taste is vanilla! At first glance these two dark chocolates look much the same. The beans look pretty similar, both are from Venezuela and both have 72% cocoa solids. But taste them and you’ll find that Las Trincheras Gold is smooth and welcoming, with soft nutty notes. 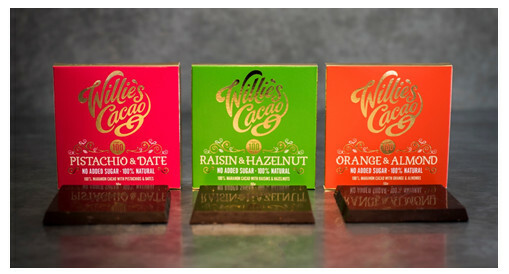 “It is the dark chocolate for everyone who doesn’t yet know they love dark chocolate,” says Willie. Next to it the Rio Caribe Gold is quite different, much deeper and more complex with coffee notes layered with the nuts. 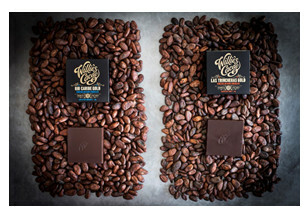 You can even taste the difference between the beans in Willie’s milk chocolates. Milk of the Gods tastes rich and nutty, while the Milk of the Stars is more intense and caramelly. Actually this has such a high percent of cacao that remarkably it has less added sugar than a 70% dark chocolate. Which leads us to the rainbow of flavoured bars, with everything from the super on trend Matcha made with ceremonial grade green tea, to Luscious Orange and Sea Flakes. Each one is 100% natural. ‘Pure ingredients make pure flavours and pure pleasure,’ as Willie says. And the short cut for recognising real chocolate in the sea of enticing packets out there? It is simple, just read the label. 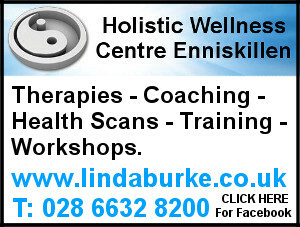 Look for chocolates with no vanilla and no soya lecithin. Needless to say, all Willie’s Cacao dark chocolates contain simply cacao, natural cocoa butter and raw cane sugar. That’s real chocolate. 1. Willie Harcourt- Cooze is something of a celebrity in the chocolate world and a few years ago was a familiar face on our televisions. 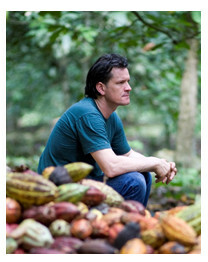 His dream of making the world’s best chocolate was born on his Hacienda El Tesoro, high in the Cloud Forest in Venezuela, where he has farmed cacao for over a decade. 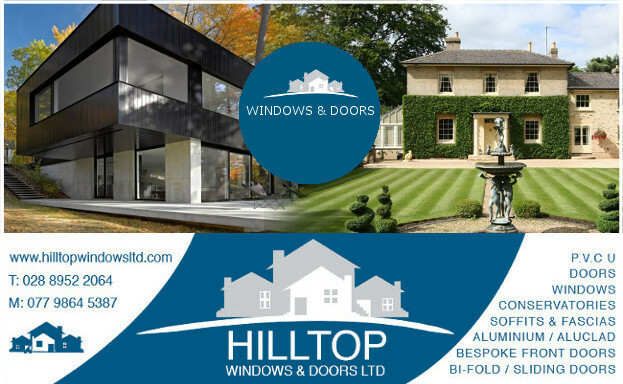 His often dramatic journey from his farm to setting up the factory from scratch, was followed in two Channel 4 television documentaries that have since shown around the world. These have been followed up with 2 recipe books, full of chocolate adventures and recipes. He spend 3-4 months every year travelling the world seeking out exciting new beans in remote jungles, or doing talks on chocolate. 2. Chocolate’s health properties. Research has identified that the high level of flavonoids in chocolate can lower blood pressure and protect your arteries. It even stimulates your body to produce serotonin, the brain’s natural anti-depressant, and feel good endorphins typically created by exercising. To get these benefits however you need to be eating good dark chocolate. The higher the % of cocoa solids the better. We all know that wines, olive oils and coffees taste different – it is the same with cocoa beans. There are more than 400 flavour notes identified in cacao. Willie uses some of the best single estate beans in the world, each with their own stunningly individual flavours born from their strain and influenced by their soil and climate. Martina, how do we position the challenge? • When you taste all the different flavours, which one will you prefer, or will you find different chocolates suit your different moods? • How sensitive are your taste buds? 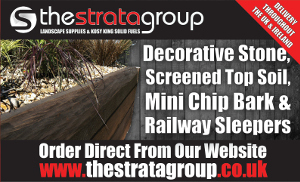 • Bet you will taste more differences than you thought you would! Do you find there are more or less differences than in olive oil or coffee? Final bar X, a new chocolate from a rare and wonderful bean that we have just a few sacks of, and we have made into a limited edition of chocolate. You simply need to come up with a short phrase of up to 5 words describing its flavour notes. The winner is the person who correctly identifies bars A-E and who creates the best flavour description of bar X. 2. Taste the chocolates. Use the flavour map and notes provided to help you identify which chocolate is which. 3. Give us your answers by going to www.surveymonkey.com/mysterychocolate and spending a couple of minutes answering the questions. 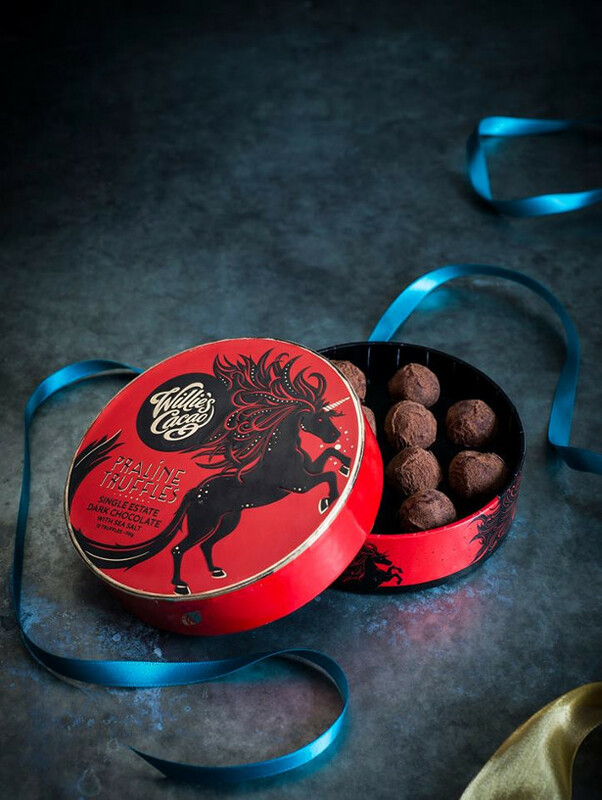 My chocolate is all about flavour, the beautiful flavours of the world’s great single estate cacaos. Like fine wines, they all taste wonderfully different. Where would you put the chocolates on this Flavour Map? To preserve these precious flavours, I make the chocolate in small batches, conching for up to 21 days at low temperatures. This is about 100 times longer than industrial chocolate. I only use completely natural ingredients, so all I add to the cacao is raw cane sugar and natural cocoa butter – no vanilla or soya lecithin. Tasting chocolate can be complicated as there are more than 400 identified flavours in cacao, and everyone tastes slightly differently. This Flavour Map has all the major categories, treat it as a guide to help you find your own way. • Have a clean palate. Maybe taste in the morning, and drink plenty of water between bars. • Eat chocolate at body temperature. If the chocolate is cold it will melt in your mouth more slowly and taste different as a result. • First break and smell the chocolate. Notice the snap of a well tempered chocolate bar, and catch the aromas which are an important part of overall taste. • Melt a small square in the centre of your tongue. The flavours will evolve as the chocolate melts. Remember to breathe as 90% of taste is perceived by the nose. • Notice the texture. I prefer to add less cocoa butter than most chocolate makers allowing the flavours to linger longer in your mouth. Now you have placed the chocolates on the map, do you have any preferences? For me there is one for every mood and one for every moment. The ultimate chocolate hamper from Willie Harcourt-Cooze. 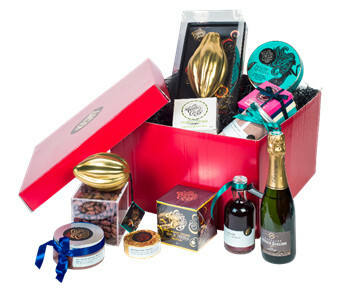 Nowhere to be found on the High Street, these hampers are the dream of any chocoholic. Willie is constantly experimenting with all things chocolate. 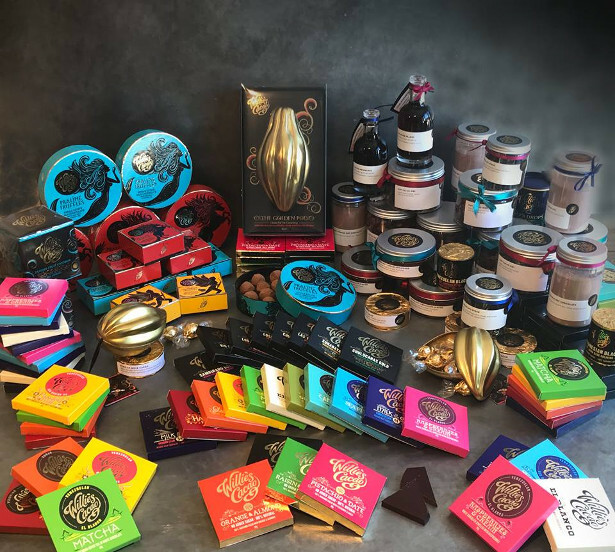 So as well as the delectable Willie’s Cacao ‘bean to bar’ chocolates you may be familiar with, this hamper contains treasures like Mole Cacao and Cacao Nib Brandy, that until recently he has simply made for family and friends. These are all handmade or made on a micro scale on antique machines from some of the best single estate cacaos in the world. 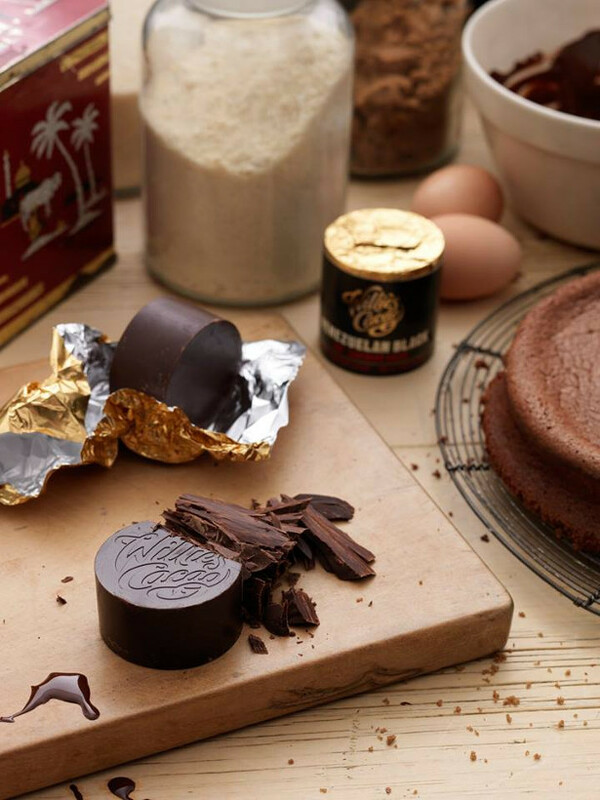 El Grande is the most luxurious chocolate hamper containing Willie’s most rare and wonderful creations. Everywhere we turn, we are being encouraged to slash the quantity of sugar in our diets. These ground breaking new chocolates help in this battle, and they do it completely naturally. They are made with 100% cacao, naturally sweetened with fruit and nuts. No artificial sweeteners, no artificial anything. They are the first of their kind. They are quite simply delicious. 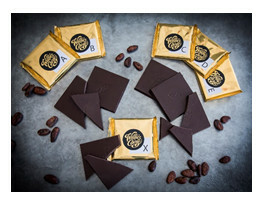 Willie Harcourt-Cooze, the pioneer of ‘bean to bar’ chocolate making, has chosen the softly floral Rio Maranon Cacao, and jewelled it with fruit and nuts. He makes all his chocolates in small batches from the best single estate cacaos in the world. He uses only natural ingredients and never adds vanilla or soya lecithin as they would spoil the flavour. To remove the acidity and preserve the precious flavour notes this rare bean from the remote Maranon canon in Peru, he conches it for a huge 21 days which is c. 100 times longer than industrial chocolate, which is conched in just a few hours. These three flavours are joining the already very successful Pure Gold, 100% Sur del Lago cacao bar. • Orange & Almond, 100% Rio Maranon cacao with orange and almond. This is the least sweet of the three as the orange is an organic orange essence so all there is only sweetness coming from the almonds. The Rio Maranon cacao is certified organically grown and is bought directly from the farmers. This direct trade puts the money directly into the farmers’s hands and Willie never pays less than $500 a tonne premium over world cocoa prices (the Fair Trade premium is $200 per tonne). 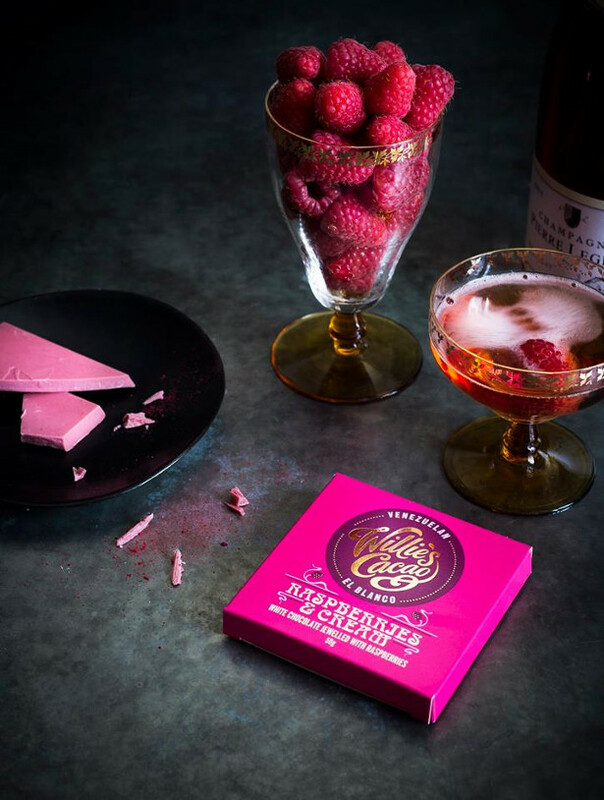 Willie Harcourt-Cooze is the UK’s pioneer of ‘bean to bar chocolate. 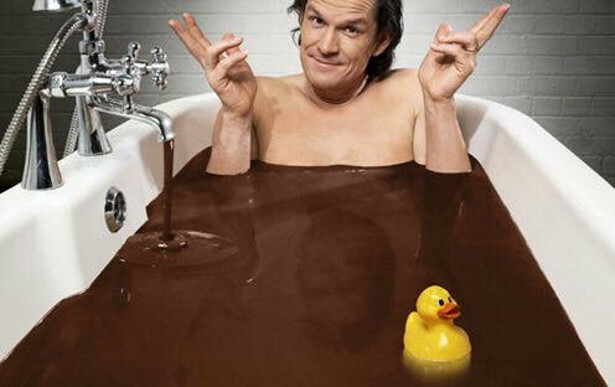 He has redefined how millions of people worldwide think about chocolate. That real chocolate can have such depth and variety of flavour, is something most people have never dreamt of. “When people eat our chocolate it’s like a light going on, as the chocolate melts and the realisation dawns that all this flavour comes simply from the cacao,” explains Willie. Willie achieves this because he makes all his simply delectable chocolate in small batches from ‘bean to bar’ using only the world’s great single estate cacaos which he sources directly from the farmers. Like fine wines, they have remarkably different flavours, one might taste smooth and nutty another of summer fruits. It is all about flavour so Willie uses no soya lecithin and not even vanilla as these hide some of the flavour notes of the beans. Similarly he uses only the best natural ingredients– raw cane sugar, unrefined cocoa butter and organic ingredients like fruit essences and raisins. All good things are worth waiting for and he makes his chocolate at low temperatures ‘to taste’. This takes up to 21 days, more than 100 times longer than industrial chocolate that is made in a matter of hours. 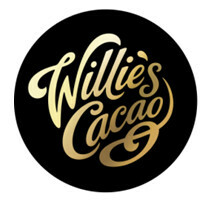 Willie’s dream of making the world’s best chocolate was born on his Hacienda El Tesoro, high in the Cloud Forest in Venezuela, where he has farmed cacao for over a decade. 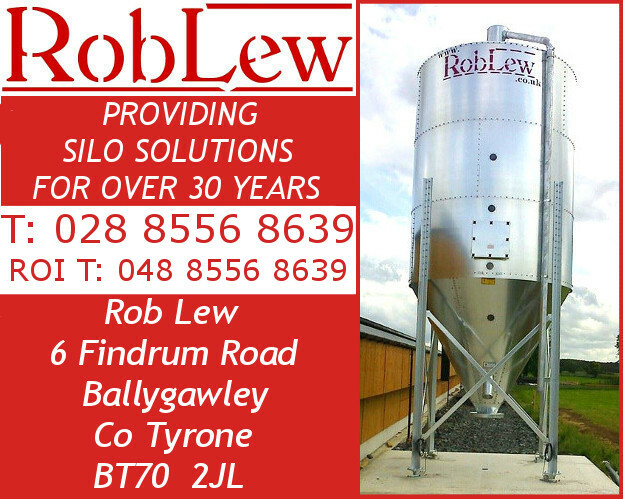 His often dramatic journey from his farm to setting up the factory from scratch, was followed in two Channel 4 television documentaries that have since shown around the world. These have been followed up with 2 recipe books, full of chocolate adventures and recipes. 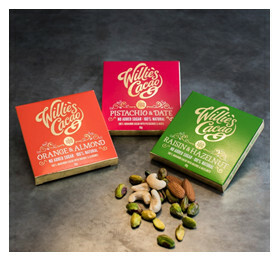 Willie now sells cooking, eating and gift chocolates in over 25 countries around the world.